Let the ASE certified mechanics at Mike’s Auto Service take care of your Lincoln service and repair needs. 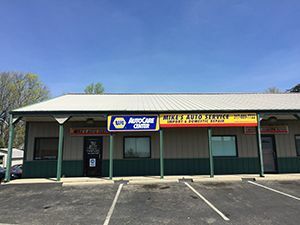 Conveniently located in Greenwood, Indiana, our family owned and operated auto repair shop offers a wide range of automotive services for new and older model Lincoln cars and trucks. From factory scheduled maintenance and tune ups, to major auto repairs and more, our skilled technicians know exactly how to take care of your Lincoln using all NAPA® and OEM auto parts. As a NAPA® authorized auto care center, you can feel confident that your vehicle is in qualified and capable hands. We retain the proper tools, training, and technology to get your Lincoln SUV or Lincoln Navigator back on the road in no time at all! We are strong believers in sincere customer service and honest work ethic, so we treat your vehicle as if it were our own. We make your Lincoln our top priority, and take our time to listen to your concerns. When you need honest and affordable Lincoln repair services, we are the professionals that can meet your service needs. Compared to dealership fees, we can offer high quality Lincoln automotive services at economy-based prices. Contact us today at 317-889-7722 to schedule an appointment.